With radical hospitality and good, dark humor, Tom Thompson encourages a care for the world and the imagination in ways that few other poets do, in ways I never thought (in Dickinson’s word) ‘possibler.’ He’s one of my favorite writers, and it’s a pleasure to know what he has to say. In this, Tom Thompson’s amazing new collection, the ‘passenger’ of the title is, among other things, consciousness, ‘a new state of nature/to which our bodies are ill-adapted’; it is also the body itself, for which the reverse of Thompson’s formulation also holds true: our relationship to the body is portrayed herein as problematic and mediated, as if we have found ourselves passengers venturing through life in a strange vessel. Among other things, Thompson presents, in hallucinatory images, how modern medical technology is not so different from the occult violence and sinister paraphernalia that have always attended upon the rituals of healing. The book’s passengers go on journeys that are visionary and sometimes disillusioning: through parenthood, faith, illness, death and love; intervening in and altering the lives of living things, from children to geraniums. 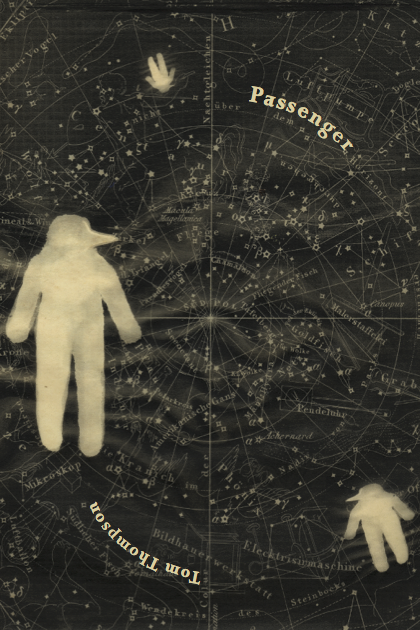 Passenger is a beautiful and moving book by a masterful poet.